On paper designs for the columns. Cumberland Piazza, in the Hotwells area of Bristol, has recently undergone a colourful and illustrative transformation. Made possible by local community groups, and in collaboration with illustrator Dave Bain, the once dismal space is now a bright and inspirational area to pass through and explore. The Piazza is a large, concrete-clad area below a flyover in central Bristol and has become a through-space for local residents. The area - austere, neglected and punctuated by seventy-three giant concrete pylons - had become an unwelcoming and unsightly dead zone. Change was catalysed by Ray Smith and Anna Wilson of the Hotwells and Cliftonwood Community Association, who opened discussions with the local community back in 2010 and began to consider ways in which the Piazza could be improved. Consequently, the Art Under The Flyover project was born and kick-started an ongoing series of arts projects and events, intended to inspire the public to improve and engage with the space. Arts Project Manager, Joanna Espinner, got involved and recommended Dave Bain as an artist with an excellent track record of community art projects and large-scale artworks. In order to truly transform the Piazza, it was evident that the design would need to tackle the vast and imposing columns that dwarf the space. Anna had long considered tonal colours to enhance the perspective of the space and collaborated with Dave to explore a colour scheme that could be used across the area. She then chose and tested the colours, ensuring that locals were happy with the plan and organised the painting, inviting people to join in. For each set of columns, a gradient of a single colour was used, ranging from light to dark. 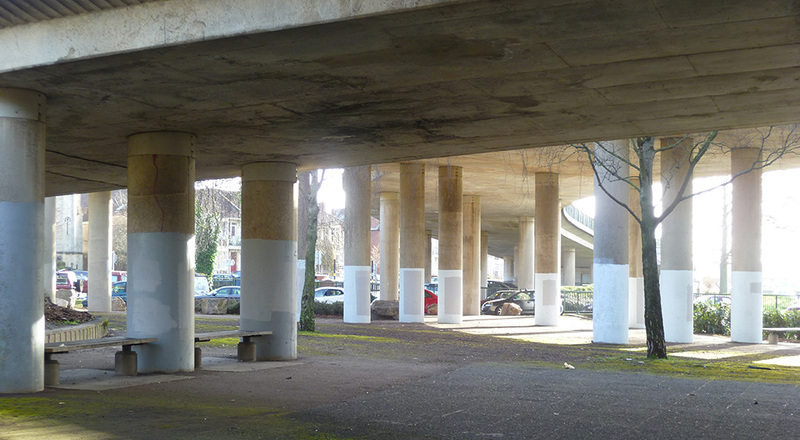 The seventy-three columns, some as high as six metres, have now been painted over the last few months, by local volunteers. Following further community workshops, and taking inspiration from the idea of ‘a concrete forest’ that the sea of columns easily lend themselves to, Dave devised a set of simple, stylised tree designs. The tree designs are scattered throughout the Piazza and the majority of the designs face into the space, to encourage a sense of discovery and shelter for visitors. As passers-by walk and cycle through the space from a variety of directions, it was important that the design catered for many different viewpoints. Enrolling the help of Paul Roberts and Loch Ness, Dave Bain painted designs on thirty-three trees over the course of four days, as well as completing the work started by the volunteer painters. Art Under The Flyover hope to build on, and celebrate, the transformation of the space, by encouraging further creative events to be held within the area. The project was funded through the hard work of the Hotwells and Cliftonwood Community Association who secured Section106 funding from two nearby developments via the Bristol City Council Neighbourhood Partnership scheme.